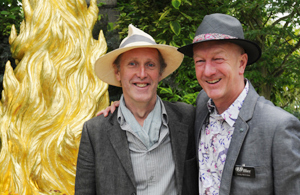 Hampshire exhibitors had an amazing year at the 2011 RHS Chelsea Flower Show. 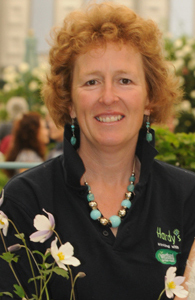 Hardy’s Cottage Garden Plants (based in Whitchurch) scooped their 16th gold medal, keeping Rosemary Hardy in her position as the most successful female Chelsea exhibitor ever. Rosemary’ s success didn’t stop there – she also won RHS Plant of the Year with her new anemone variety, Anemone Wild Swan, which was launched by English National Ballet School dancer Beth Finch. The plant has petals of white with blue reverse, blooming from May to November and in the morning and evening when the flowers nod and half close, the blue backs are revealed. It reaches a height of between 18-24 inches and grows best in partial shade in humus-rich soil where it would look stunning in a drift. Over 3000 plants filled the display which also featured two walk-through pathways in soft yellow- brown tones leading into the centre of the display. Rosemary used full sized trees for the 1st time at Chelsea and thirteen Carpinus betulis at about 2.5m in height gave structure to the middle of the stand. Another record breaker was Hiller Nurseries from Romsey who overcame a difficult growing season to win their 66th consecutive Chelsea Gold medal with a spectacular exhibit “Feel Good about Gardening”. The medal makes them the exhibitor with the longest unbroken run of medals in the history of the RHS Chelsea Flower Show. Their giant display featured 3,500 plants, mature trees and an eye-catching sculptural centrepiece ‘Golden Cypress’. It emphasised the effects of gardening on the well-being of those involved, and its benefits in modern society. It featured five themed gardens for exercise, contemplation, meditation, stimulation and indulgence and used natural aromatherapy and colour to influence mood and well-being. Plant hightlights included Sinocalycalycanthus raulstonii ‘Hartlage Wine’– a rare shrub with glossy, green foliage and delicately scented semi-double flowers which have a cluster of cream central petals around a deep burgundy centre. Sparsholt College also had success with the work of 16 National Diploma Horticulture students winning a gold medal. They showed a garden created with the plants that have influenced and stimulated architecture, artists, musicians and poets over the ages. The garden included Flander’s Fields, Scarborough Fair, Monet’s Water Lillies, Wordsworth Daffodils and an English Country Garden. Lecturer Chris Bird described the medal as “absolutely wonderful”. In addition to securing a Gold award, Sparsholt College were also the winner of the Best Continuous Learning Exhibit. Other gold medallists included Hampshire Carnivorous Plants from Southampton, and palm tree specialists Ainsworth Displays from Waterlooville who both exhibited in the Floral Marquee. Also with a display in the Floral Marquee were Heucheraholics of Lymington. Their stand featured a purple car and the theme of ‘Just Wed’. The Gaze Burvill “Watts Seat” was shortlisted for the Chelsea Product of the Year. Designed by Simon Burvill and inspired by a design by Mary Seton Watts, the substantial seat is hand crafted from European Oak. The Watts Seat celebrates Victorian painter and philanthropist George Watts’ vision of ‘Art for All’. Every seat sold will include a donation to the Watts Gallery. Also on the shortlist was the Nether Wallop Trading Co Ltd Herb Dryer.Providing a contemporary twist on a traditional practice, the Nether Wallop Herb Dryer dries herbs, chillies, mushrooms and seeds with no power required. Innovative, practical and easy-to-store, the dryer can be used time and time again. Of course the show gardens are one the main attractions, occupying a whole avenue. 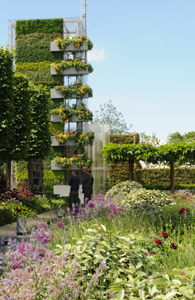 This year, B&Q (who have a head office in Eastleigh) displayed the tallest ever Chelsea garden at nine metres high. It showcased the notion that we should be planting and producing food wherever we can since it is estimated that food in London would run out infour days if supplies ceased. The garden aimed to encourage individuals and communities to develop new local and sustainable food growing spaces and make an environmental difference while enhancing urban greening. It featured a vertical potting shed which incorporated composting, rainwater harvesting and storage, a thermal chimney, photovoltaic panels and a wind turbine. All of the plants were edible and the display included plants with edible rhizomes, bulbs, leaves, flowers, fruits and seeds. Many of the plants were also attractive to bees and other pollinating insects and help improve the biodiversity of the garden. Some of the more unusual species used were the Aztec Herb (Stevia rebaudiana), which has very sweet tasting leaves and is used as a sugar substitute, and Spignel (Meum athamanticum,) a native plant with edible leaves and roots. The garden was awarded a gold medal. As ever, the show attracted plenty of famous faces, and Gwyneth Paltrow was spotted taking a tour of the B&Q garden. 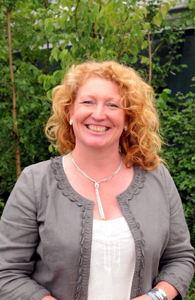 There were also famous faces with a more local connection such as Charlie Dimmock who is a former pupil of Wellow Primary School and also The Mountbatten School in Romsey.